University of Nebraska Press, 9780803280670, 168pp. 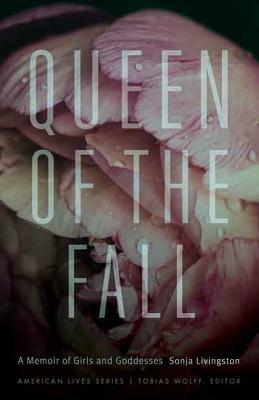 Whether pulled from the folds of memory, channeled through the icons of Greek mythology and Roman Catholicism, or filtered through the lens of pop culture, Sonja Livingston’s Queen of the Fall considers the lives of women. Exploring the legacies of those she has crossed paths with in life and in the larger culture, Livingston weaves together strands of memory with richly imagined vignettes to explore becoming a woman in late 1980s and early 1990s America. Along the way, the award-winning memoirist brings us face-to-face with herself as an inner-city girl—trying to imagine a horizon beyond poverty, fearful of her fertility and the limiting arc of teenage pregnancy. Livingston looks at the lives of those she’s known: friends who’ve gotten themselves into “trouble” and disappeared never to be heard from again, girls who tell their school counselor small lies out of necessity and pain, and a mother whose fruitfulness seems, at times, biblical. Livingston interacts with figures such as Susan B. Anthony, the Virgin Mary, and Ally McBeal to mine the terrain of her own femininity, fertility, and longing. Queen of the Fall is a dazzling meditation on loss, possibility, and, ultimately, what it means to be human. Sonja Livingston is an assistant professor in the MFA Program at the University of Memphis. Her first book, Ghostbread, won the Association of Writers and Writing Programs Book Prize for nonfiction.